The Aggie Core Values don’t go away when we graduate. Aggies are known for their hospitality and friendliness. To extend this selfless service in Nueces County, NCAMC aims to host opportunities to volunteer in our community as a club several times a year. 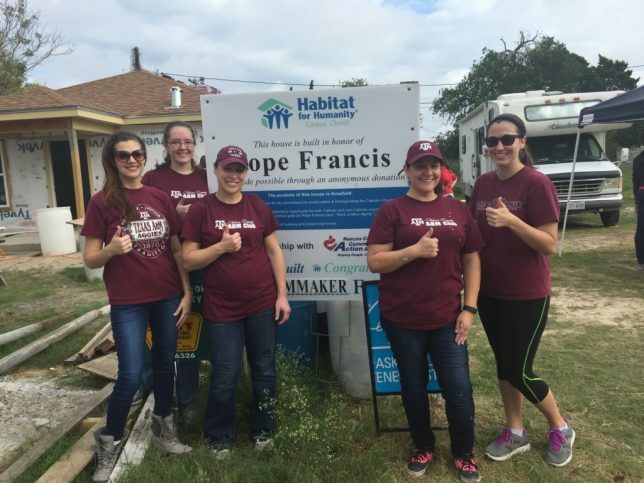 In 2015, we kicked this off with a Habitat for Humanity build! In 2019, we hope to complete a couple beach cleanups on Saturday mornings and continue volunteering with Habitat for Humanity. For information about service opportunities, please contact our Service Chairperson Katherine Chang at 979-251-0731 or klchang84@gmail.com.